It was my niece's 18th birthday last Sept. 25 but we had a party for her last Sat. 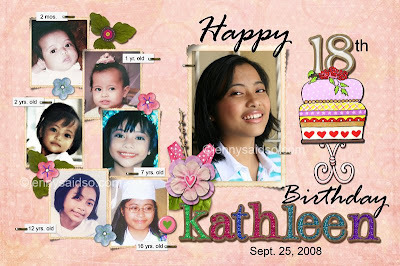 (27th) and here is the layout of the tarpaulin that I made for her. A relative of my sis-in-law had it printed 4' x 3' in size and I am happy with the result bec. it is not pixelated. But I know it will turn out nice since I made it using 300 dpi. I also made a simple matching invitations for her. Ang ganda ate jen! Hayy sana naman mkbalik scrap mojo ko hehee gsto ko ulet magscrap dami kong dinadownload n freebies inaamag sa laptop ko ahahaa thank u for sharing ate jen, that was really nice po! Good job, Ate! Happy bday to your niece! You're next! !